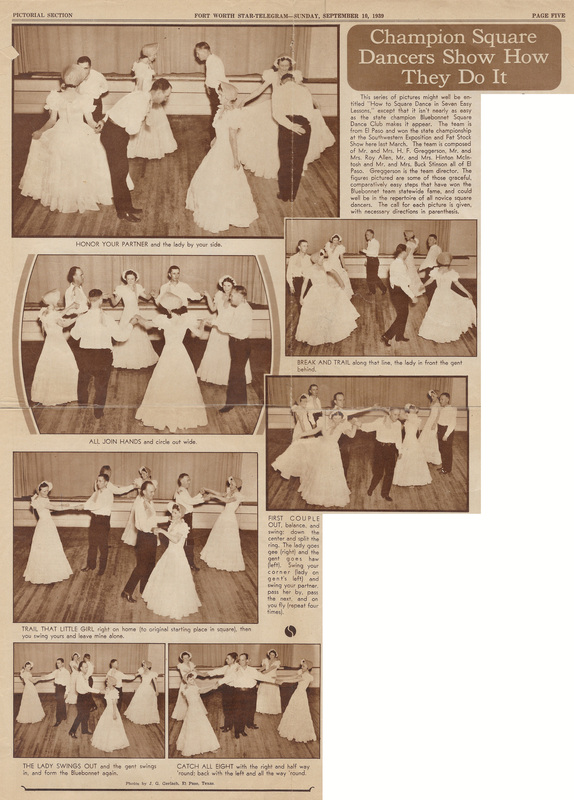 This 1939 newspaper pictoral spread looks at Herb Greggerson's Blue Bonnet Set, the team that won the Texas square dancing championship in March that year. Before that, the prize was often taken by Bob Sumrall's Abilene Set. The introductory text reads: "This series of pictures might well be entitled "How to Square Dance in Seven Easy Lessons," except that it isn't nearly as easy as the state champion Bluebonnet Square Dance Club makes it appear. The team is from El Paso and won the state championship at the Southwestern Exposition and Fat Stock Show here last March. The team is composed of Mr. and Mrs. H. F. Greggerson, Mr. And Mrs. Roy Allen, Mr. and Mrs. Hinton Mcintosh and Mr. and Mrs. Buck Stinson all of El Paso. Greggerson is the team director. The figures pictured are some of those graceful, comparatvely easy steps that have won the Bluebonnet team statewide fame, and could well be in the repertoire of all novice square dancers. The call for each picture is given, with necessary' directions in parenthesis." 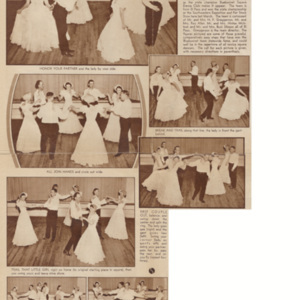 “Blue Bonnet Set - 1939,” Square Dance History Project, accessed April 26, 2019, http://squaredancehistory.org/items/show/1543.